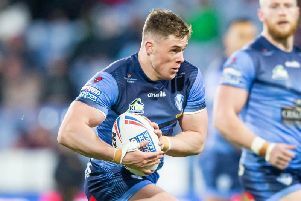 Wigan's nightmare 24 hours was completed as they went down 22-12 to arch rivals St Helens in the opening match of the 2019 Betfred Super League season. New Wigan coach Adrian Lam will be equally delighted with his club's new additions, with Zak Hardaker settling in well on his first Super League appearance for 16 months and former Barrow prop Joe Bullock showing he has the qualities to perform at the top level. There was no stopping prop Ben Flower, however, as he charged onto Sam Powell's pass close the line and Hardaker converted the try to halve the deficit. Saints were pressing again five minutes before half-time when Wigan winger Liam Marshall intercepted Coote's pass meant for Naiqama and showed a clean pair of heels to all pursuers on an 85-metre sprint for his side's second try. Hardaker's second goal levelled the scores and the prospect of golden point beckoned until a spectacular finish from Welsh international winger Regan Grace nine minutes into the second half restored Saints' advantage.